This was a very exciting experience for Lib and me as we passed out fun fiction books to a class of third grade students at Ridgely School. We were greeted with a group hug from the whole class and celebrated on Pajama Day, the last school day this year. We talked about our Rotary Club's thirty year involvement with Ridgely Elementary School. (I also mentioned that my first time tutoring was 50 years ago at Cabrini Greens in Chicago.) 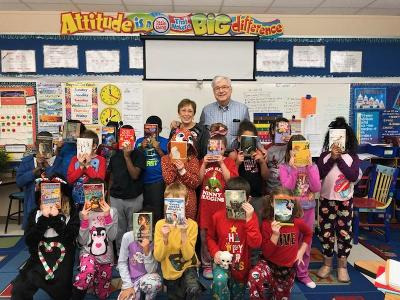 The program at Ridgely was made possible because of the encouragement of Ridgely teacher Asima Rahman, assistance from School District 186 staff, and the hard work of John Delich of Barnes and Noble. But without the 2018 Literacy Grant from our Rotary District and encouragement from Vicki Megginson and David Fowler in our Rotary Club, it would not have been achieved. The books were specifically selected to match the reading levels of each of the 20 students, and we will enjoy discussing them after the students return from break. In January, we will begin focusing on their special interests with a series of books beginning with their current reading level and advancing two more steps. The goal is to increase their reading proficiency, spark their interest and increase their love of reading.